Bring your friends to HVS for Fowling. Fowling is a hybrid game that integrates American football and bowling into one fun sport. 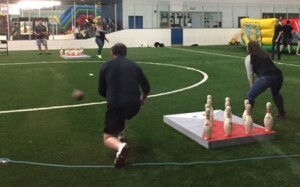 The mission of fowling is for teams to be the first to knock down all opponent’s pins by throwing a football at 10 bowling pins positioned in a traditional bowling layout. Play one-on-one or in teams! For more information or to book your party, contact us at (734) 487-7678.